* 170 hostages, including 140 guests and 30 employees at the 190 rooms Radisson Blu Hotel in the Malian capital Bamako, were seized by Islamic gunmen. on Friday 11/20/2015 AT at about 08:30 local time, the hotel said in a statement. At least three people, including two security guards were reportedly killed when attackers stormed the hotel which is popular with foreigners and UN staff . Three hostages reported to have been killed. At least seven Chinese nationals are reportedly among the 170 hostages, Chinese diplomatic sources in Mali told Anadolu Agency. According to eye-witnesses, the number of hostage takers is between three and five, who arrived at the hotel in a stolen car with diplomatic number plates. The gunmen opened fire immediately, killing the guards and injuring several other people. The US embassy instructed its staff to seek shelter via its official Twitter account. Ansaru Dine, a Malian group with links to Al Qaeda, has previously claimed responsibility for a series of attacks on UN peacekeepers and the Malian army in Bamako and areas near the Ivory Coast and Mauritania borders. Tuareg separatists are also active in the North. Some reports say about 10 gunmen in total are involved in the attack. A Malian army commander told the AP news agency that about 20 hostages had been freed. Hostages able to recite verses of the Koran were being released, a security source has told Reuters news agency. 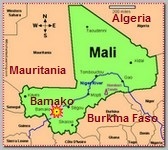 After few hours, at 19:00 local time, the hotel was stormed by Mali special forces. An unnamed UN official has said at least 27 people have been killed. It is not clear if this includes two of the attackers who are reported to have died. But at about 22:00 local time Security ministry spokesman Amadou Sangho told Reuters news agency that some of the gunmen were still “dug in in the upper floors”. But “The attackers no longer have hostages,” Sangho said. Al-Mourabitoun, affiliated to Maghreb al-Qaeda – AQIM, a group based in northern Mali, withe Abu al-Nur al-Andalusi as its field commander, and made up mostly of Tuaregs and Arabs, posted a message on Twitter saying it was behind the attack on the Radisson Blu hotel, where hostages are still being held. France’s defence minister said Friday that notorious Algerian militant Mokhtar Belmokhtar was “likely behind” a deadly attack at a luxury hotel in Mali but acknowledged it was not certain ( See also – In Amenas Raid ) . On Wednesday 11/18/2015 2 female suicide bombers have killed 11 people in a mobile phones market inside the Farm Centre in northern Nigeria’s main city, Kano, police said. On Tuesday 11/17/2015, more than 30 people were killed by a suicide bomber in the Nigerian north-eastern Yola city in an attack blamed on Boko Haram. Malian special forces have arrested two suspects in connection with the siege at the Radisson Blu Hotel, according to officials 0n Thursday 11/26/2015 .